Hi guys! Nothing too exciting today. I've had these on about a week and a half.. I was messing around my new OPI Axxium gel polish. Most people get good wear out of gel polish, but I tend to be a bit harder on my nails than the average person.. ha. Still, it hasn't done too bad. I only lost two studs. I'm probably going to soak them off before this weekend and try my Gelish stuff out next. For the record, I was listening to way too much Katy Perry when I did these..
.. and when I did my hair. It's nice being able to do crazy colors again! 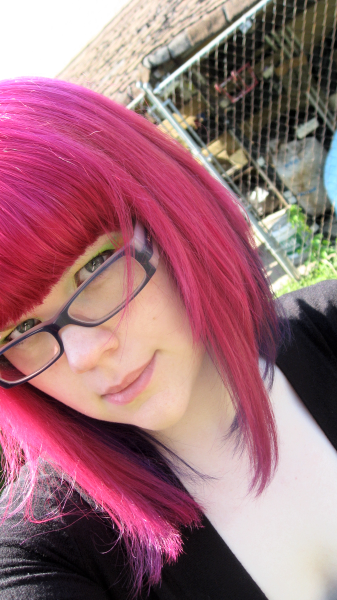 I went with pink, and purple underneath. I need to touch the pink up already.. been using Manic Panic since it's available, but I need to order some SFX for staying power. Also, don't forget to enter my giveaway if you haven't already! I haven't gotten many entries.. it makes me kind of sad. I probably should've gone with a more general theme, I suppose.. Anyway.. see you next time, guys! I like them! and your hair is great!! I'm afraid to do anything major change between, blonde or brown! haha and there is nothing wrong with Katy Perry, have you seen her movie?! it was really good! The nails are so cute & I love your hair!